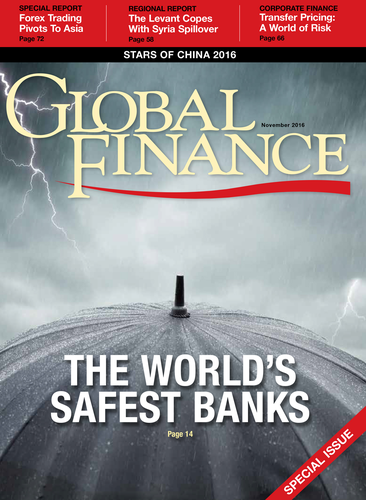 This issue focuses on Global Finance's annual ranking of the World's Safest Banks—among the most widely recognized and appreciated of our awards. The ranking is meant to be a working tool for corporates that deal with banks on a daily basis. Analyzing the long-term ratings given to the largest financial institutions in the world by the three major rating agencies is also an annual study of the health of the sector. The Safest Bank rankings require a lot of data analysis, but every year they point to new trends and important developments. While only a few countries are still able to maintain a AAA sovereign rating, we see upgrades among Asian nations and banks and the increasing solidity of Nordic financial firms. This year we also decided to look at the top-ranked banks of the past five and ten years: a tribute to the safest of the safest that highlights the dramatic changes in finance since 2006.Of course, past performance is no guarantee of future results.